As celebrated artist Troy White finds inspiration in a 70 year old victory. “Sod Off!” is the latest painting by internationally renowned artist Troy White. It has been painted to honour the flyers of the Battle of Britain. 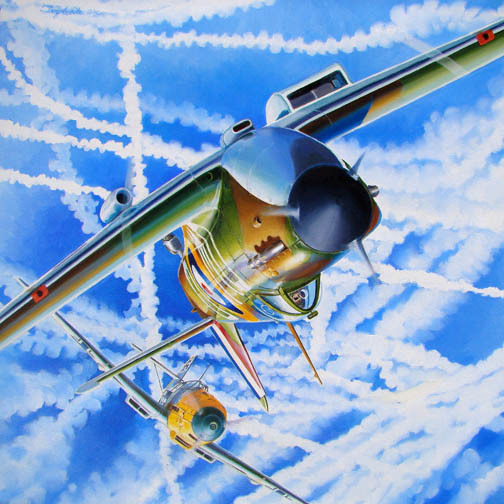 The painting represents the deadly engagement in the skies above England between Pilot Sgt. Ronald Fairfax Hamlyn of the 610 (County of Chester) Squadron and Ofw. Karl-Heinz Harbauer of 4. Staffel, II./JG 2. on August 30th 1940. “Although I have always enjoyed painting Spitfires, prior to “Sod off!” I had never painted any from the Battle of Britain, I figured the 70th Anniversary was as good a time as any to do so. The iconography of a Spitfire versus Messerschmitt could not be passed up. I wanted a composition that was fully rotational, one that would work however the canvas is hung and when completed would be a symbolic representation of the great aerial battle. Accordingly I foreshortened and truncated the subject to give the impression of speed and drama. During the summer of 1940 the English people looked aloft to see a unique phenomenon. Condensation trails from high flying aircraft crisscrossed and swirled in the skies making patterns describing the battle. This symbolic image of that titanic struggle is what I wanted to use for my backdrop. At the same time I wanted to portray actual people and machines and depict a specific moment in time. Between August 13 and September 15th was the most critical phase of the battle. Ronnie Hamlyn’s story of August 30th 1940 fit the bill perfectly; his victory that day was proven without doubt as he saw the Messershmitt he had downed burning near West Malling. On August 30 1940 for the first time during the Battle of Britain, Fighter Command flew more than 1,000 sorties in a day. Thirty-six Nazi aeroplanes were shot down but even so it was one of the RAF’s darkest days. The radar stations of Foreness, Beachy Head and Pevensey were badly damaged and over 50 RAF personnel had been killed on the ground (39 of these at Ronnie’s home base Biggin Hill) Thirty-nine Spitfires and Hurricanes were destroyed and 10 pilots were killed. To date over 20% of the Fighter Command’s pilots had been killed. Losses of this magnitude were unsustainable. “I was Green Leader. I first sighted enemy aircraft over Ashford and started to attack them but a number of M.E. 110's attacked me before I could open fire. So I eventually fired at one of the M.E's. He fell away from the rest, but I could not possibly see any result owing to the other enemy aircraft. On returning to base at 1,000 ft I noticed more aircraft bombing Biggin Hill. I at once climbed up to about 20,000 ft and was attacked by 5 M.E. 109's which were circling. Owing to my slow speed I was easily able to get on the tail of the last 109. I fired a burst of about 2 seconds from astern with slight deflection. He fell away from the others smoking badly. I followed him and gave him the rest of my rounds in one burst. He went straight in the ground. I came down to the place I thought I had seen him hit and there was a large fire burning in the wood round West Malling aerodrome. Troy White is an internationally renowned artist. He holds a Masters Degree in Fine Art from Florida State University. He is particularly well known for his aviation paintings which grace public, corporate and private collections worldwide. Troy White’s last exhibition “Out of the Blue” toured in Australia and was sponsored by Qantas, Rolls Royce Aviation and Fosters. His work is greatly influenced by a love of aviation and he is an avid skydiver and pilot.